Is it possible to innovate without loving what you do? I spotted this question on a Linkedin group and thought I post it here. My answers is: Yes, it’s possible. Interestingly, HBR posted an article about why you shouldn’t do what you love last week. I encourage you to read it if you haven’t already. A few years ago I was advising three guys who wanted to start a t-shirt company business in Mexico. These guys were still in college and were studying graphic design. In Mexico there is a brand called Naco that started a trend of inverting words so something like AC/DC looks like AISI/ DISI. People found this funny and so these shirts started selling like hot cakes. Tagged Innovation, problem finding, Strategy. According to congressman Jesse Jackson Jr., the iPad is killing jobs. Tagged Innovation, politics, status quo. Tagged Harvard Business Review, Innovation, Innovation and Idea Management. Ad house Wieden+Kennedy created the above mural. 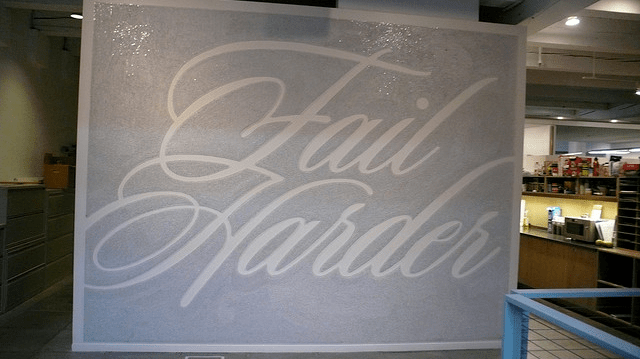 Over 100,000 thumbtacks were used over 351 hours to create this typographic mural that spells out Fail Harder, a message that underlines the importance of failure during the creative process. First time I saw this mural was on the movie Art and Copy, which I watched again a few hours ago. I felt inspired to post it here and share it with you!